With an unbreakable will, Watashi continuously strives to raise Kaatan, his kappa, as well as he possibly can. Though always faced with difficulties, he's never disheartened. Don't worry about his face! 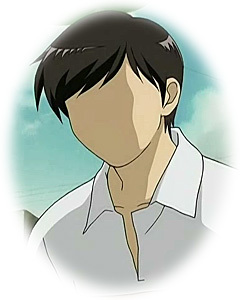 In fact it's nothing unusual; in this anime, all of the human characters have a stark lack of facial features. Watashi is studious and spends a great time studying the "How to Raise a Kappa" series of books. From them he gleans kappa know-how and applies it to his every-day activities with Kaatan. We learn later that Watashi grew up with a kappa in the countryside, which may explain his undying love for kappa in general! Although able to in Japanese Folklore, kappa in this anime cannot talk and therefore aren't always able to communicate clearly with the humans, though they seem to be somewhat efficient at communicating between themselves, evidenced by the large number of kappa friends Kaatan eventualy makes! Sakamoto works at the local pet store where Watashi originally purchased Kaatan. She is extremely knowledgeable about kappa and a great help to Watashi on many occasions. But be careful! She's also extremely good at her trade and never misses an opportunity to peddle her kappa-related goods! She is a hard sell. Kyuu lives at the pet store with Sakamoto. He has a cracked shell from a past injury and so no one wants to purchase him. After a rough beginning, Kyuu finally becomes good friends with Kaatan, and they enjoy playing together and with the other kappa. 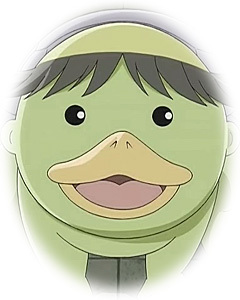 Kyuu is voiced by Takeuchi Junko, famous for the voice of Naruto. Despite his outward appearance, Chii is not at all an unfriendly kappa! Originally feared by all, Chii eventually becomes one of the gang and has helped out considerably on more than one occasion! Also likes to play the trumpet, though may find it difficult given that he has a beak. 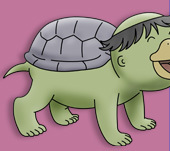 Kakkun is a very bright kappa who looks after and plays with the slightly younger generation, including Kyuu and Kaatan. Later in the series, Kakkun's owner, a local lady, begins sending him on errands. Kakkun learns the value of money and saves up the 1 yen coins given to him each time he runs an errand. Kakkun is also likely to be the most generous kappa you will ever care to meet!